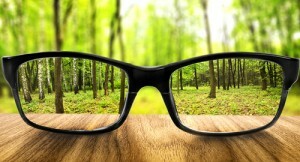 What Is Astigmatism and How Is It Treated? Astigmatism is a common refractive error that affects vision close-up as well as far away. It results from an irregularly shaped cornea or inner eye lens that prevents your eye from being able to properly focus light on the retina, which can ultimately lead to blurred vision. Most people have astigmatism to a certain degree, though it may not affect their vision or require treatment. Others with more advanced astigmatism may suffer from blurry vision as well as discomfort and headaches. The eye condition often occurs in addition to other refractive errors like myopia (nearsightedness) or hyperopia (farsightedness) and can be treated with glasses, contact lenses, or refractive eye surgery. During your comprehensive eye exams, one of our experienced eye doctors will test you for astigmatism. If you prove to have the condition and require treatment, they will educate you on your options. One way to treat astigmatism is through the use of eyeglasses or contact lenses, both of which compensate for astigmatism by altering the way light enters your eyes. Another method is through laser surgery, like PRK and LASIK. These options can treat some types of astigmatism and are effective in the way they gently alter the shape of the eye for long-lasting vision correction. If you have any questions about astigmatism, or you’re ready to schedule an appointment with one of our eye care professionals, please feel free to contact us. Receive Exclusive Promotions & Discounts in Your Inbox. Referring Doctors, please use our referral form by clicking below. 4.9 / 5.0 based on 523 reviews.